Eight tips to steer a mobile restaurant business in the right direction. During the height of the recession in early 2009, Washington D.C.-based Peter Korbel and Justin Vitarello threw caution to the wind and opened Fojol Bros. of Merlindia, a high-end Indian-style restaurant. Korbel and Vitarello dressed in colorful costumes and answered to made-up names, all while serving up dishes like chicken curry and spicy beef stew. But Fojol Bros. isn't your typical brick-and-mortar restaurant. Korbel and Vitarello entered into the increasingly popular food truck industry. A far cry from traditional hot dog carts, food trucks now peddle everything from gourmet cookies to lobster rolls. In fact, the National Restaurant Association named food trucks a top trend in its "What's Hot in 2011" survey. But there's more to this specialty business than buying the food, the vehicle and parking it curbside. Here's what you need to know to steer your own food truck onto the right path. First stop, city hall. Research whether your local regulations accommodate your company's business plan. "Food safety codes, laws and regulations can vary substantially depending on where you are," says National Restaurant Association's Hudson Riehle, a senior vice president of research. Washington, D.C., for example, is one of the more food-truck friendly cities. Officials there held a series of meetings last summer called "You Don't Have to Sell Hot Dogs," to encourage street vendors to broaden their offerings. Choose a specialty item that can be assembled easily and sold quickly at an affordable price. For instance, Korbel says he and Vitarello chose to serve curries with basmati rice because they could easily make and keep it in large batches. "You only have one serving window, so you have to be extremely fast," Korbel says. Fellow D.C.-based food truck Red Hook Lobster Pound offers just a few variations on two products -- a lobster roll and a shrimp roll. It serves between 150 and 350 customers in a two-hour timeframe, co-owner Doug Povich says. 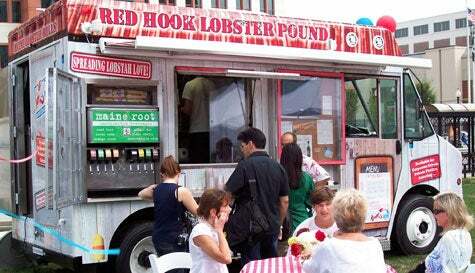 The Red Hook Lobster Pound food truck. Keeping perishables cold and griddles sizzling is essential, but can be challenging. Povich had to scramble one afternoon after the truck's generator failed with 50 customers in line and no other power source. Since then, he installed a backup inverter that runs off the truck's engine. "Some people put in two generators, others use a backup that's battery-based," Povich says. "No matter how you handle it, that's an important component to consider." A blustery day, for example, can spell a drop-off in foot traffic. On average, Korbel and Vitarello say business can drop by as much as 40 percent on days when temperatures fall below freezing. "The model isn't based on serving 365 days per year, but instead roughly 10 months per year," Korbel says. "As with most retail, this is about … the ability to move from location to location," says Mark Loschiavo, executive director of Drexel University's Baiada Center for Entrepreneurship. Parking at tried-and-true "hot spots" can help guarantee a crowd, you'll likely be competing with other food trucks for customers and space. Povich opts to park in less-tested, underserved neighborhoods. "We have the view that if a market is not lucrative now, we may be able to develop it into one," he says. Use social media to attract the crowds. Fojol Bros. and Red Hook Lobster Pound often have hundreds of customers already waiting by the time they arrive curbside, thanks to location alerts they post for customers on Facebook and Twitter. Buzz generated by social media "absolutely translates into our bottom line and lets you create these cult followings," Korbel says. Loschiavo says Pennsylvania-based Insomnia Cookies, which peddles gourmet cookies on college campuses, has expanded its food truck operation by catering business meetings and selling gift cards. Fojol Bros. also offers catering, which it expects to eventually comprise almost half of overall revenues. "It's a really lucrative revenue stream, but you don't want it to take your truck off the street, where it's not only selling your product, but advertising itself," Korbel says. For Red Hook Lobster Pound, Povich's wife Robyn (commonly referred to as the "lobster lady") always chats with customers, and remembers regulars by name. Similarly, Korbel says the Fojol Bros.' neon-painted truck, and the fake moustaches they wear, keep customers coming back. "I guess you can just sell good food, but we feel what sets us apart is that we offer them a traveling culinary adventure," he says.